Why gather Informal Sector data? The informal sector provides a valuable service to the South African recycling economy, saving municipalities up to R750m per year. Integrating them into the formal economy is an imperative in the upcoming Industry Waste Management Plans that the Paper & Packaging, Lighting and e-Waste sectors will be submitting to the Department of Environmental Affairs. Operational efficiency – Industry Waste Management Plans can more actively support the sector if it doesn’t require a perceived unnecessarily high level of subsidisation. Funding can be more readily made available when the sector is shown to not only offer important social gains, but economic ones as well. Accountability – The formal sector is more likely to accept and even assist the informal sector if each is held to similar standards of accountability. This accountability is both from the view of implementing good business practices, but also by being held to account for adequate performance. 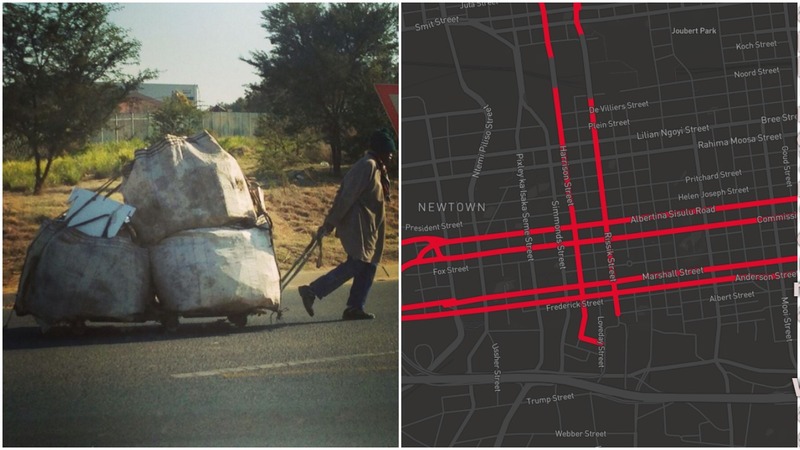 Planning – understanding and mapping informal routes, yields and other waste logistic metrics make it possible to plan for informal sector contribution to local and national service provision. Busting myths – there are many preconceived ideas about the informal sector participation in waste management and recycling. Much of it is anecdotal and perhaps not even totally unfounded, however I believe that good data and professionalism from the sector will dispel many myths which might otherwise create a reluctance to fully embrace the potential of the sector. Any formalised system works best when data drives decisions, so inclusion of the informal sector will require them to be mapped and accounted for. This will: help prevent clashes; will highlight the severity of problems when such clashes do inevitably occur; and possibly provide methods for remediation with formal systems. 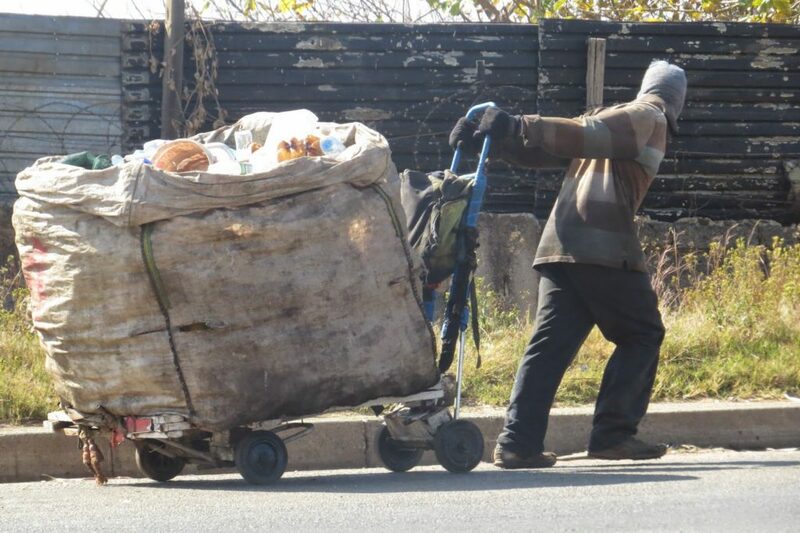 One of the segments of the informal sector that play a very visible role are Street Waste Pickers. Those individuals who pick waste from municipal skips and households bins, collecting material and selling it onto BuyBack Centres. They are often characterised as pushing “trolleys”, or more accurately, pallets with wheels and a handle, loaded with material contained in a bulk-bag. There are some variations on this. Usually the trolleys are flimsy and hand-made, but sponsored trolleys are more robust and manufactured to a high standard. 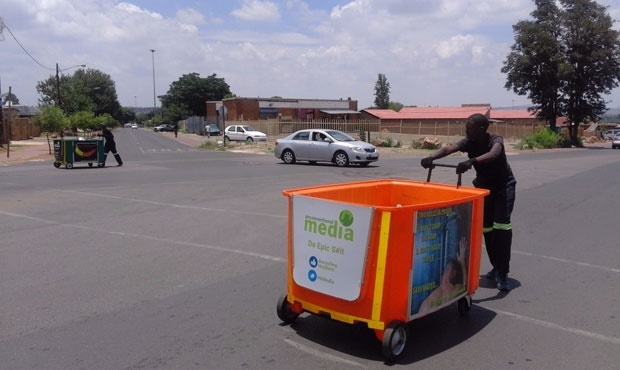 Manufactured trolleys have been sponsored by municipalities and NGOs in the past, and this is likely to sharply increase with the implementation of Industry Waste Management Plans. I’m proposing that we develop a telemetry system that is fitted to the trolleys. This telemetry will gather GPS and load data, and transmit it to a central server. There will be two models – one for new installation on newly manufactured trolleys, and one for the hand-made and existing manufactured trolleys. Let’s call these the Full Telemetry and Lite Telemetry models. 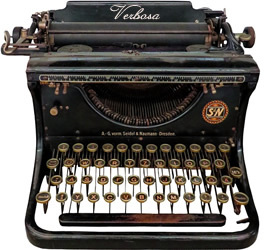 The former will be be of a higher technical specification and be able to collect better data. The latter will be cheaper to manufacture, will collect less data and will be more “disposable” i.e. the likely loss of the unit is factored into the design. The Full Telemetry units will be equipped with a long-life battery, allowing the unit to operate for 1 – 2 years on a single charge. They will be fitted as standard on newly manufactured trolleys. The Lite Telemetry units will have a smaller battery, but operating less energy-intensive sensors, and so should last up to 1 year on a single charge. They will be fitted to existing trolleys in exchange for an incentive, participation in larger recycling schemes, or in exchange for other services or equipment. Information about load contents will be verified at BuyBack Centres. These services will be incentivised for access to data reporting for that BuyBack Centre & benchmarking against others, participation in larger recycling schemes ,or directly via per-verification incentives. Combining Buyback Centre data capture, Full and Lite Telemetry data, and applying statistical modelling techniques, will provide immense value to the recycling economy.